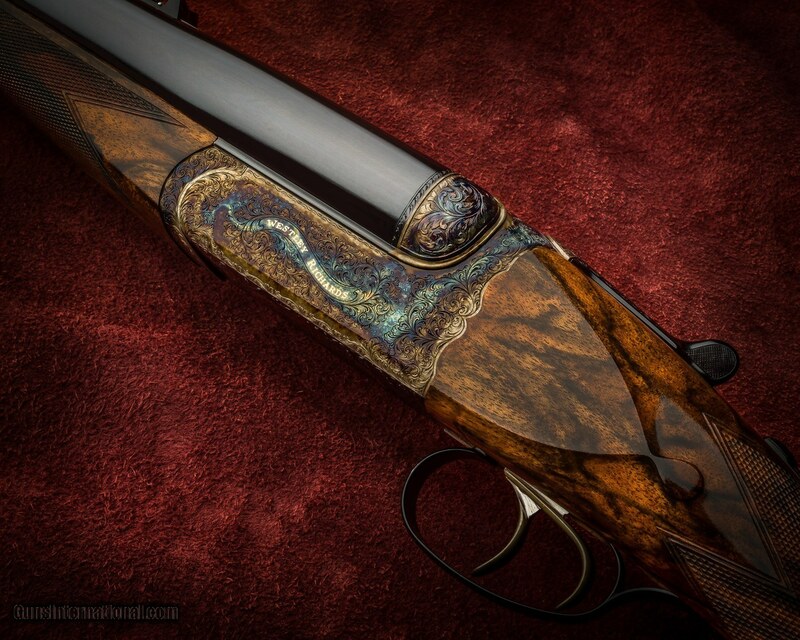 Westley Richards & Co. .577 3" NE Best Quality Hand Detachable Lock Double Rifle finished in 2015. 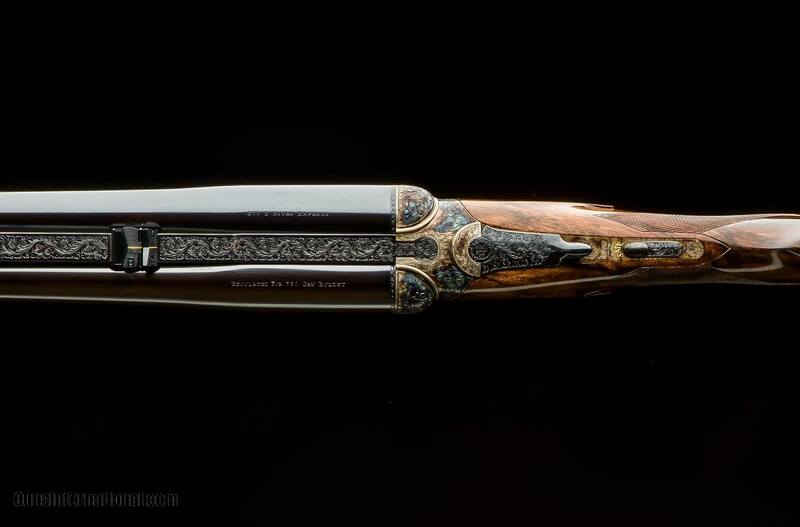 Westley Richards famous Droplock action with a scroll back, hinged cover plate, Snap Action Lever work and Model "C" Doll's Head Extension, non-automatic "beetle back" safety, two triggers with the front one hinged, disk set strikers, and Westleys' patent ejectors. Action is color hardened with blacked furniture and wonderfully engraved in small scroll in a traditional House "diamond" pattern with the Maker's name inlaid in gold on the top rib and on the action sides in flowing banners. Rolled trigger bow for a right hand shooter and an extended tang to a trap grip cap. Serial number is also inlaid in gold. 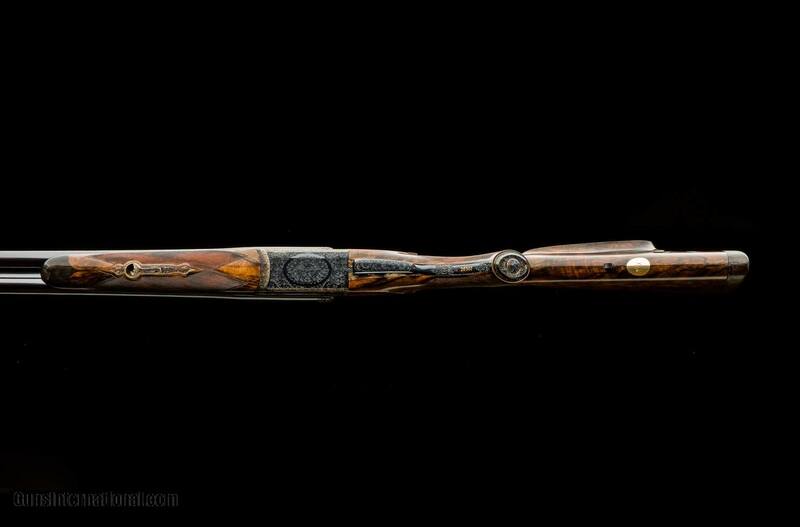 Rifle is fitted with 25" chopper lump barrels, WR pattern full length quarter rib with a standing Express sight (50 yds) and a single folding leaf (100 yds) both lined in gold with WR's patent combination front sight with a flip up moon-sight. Barrels and sights are regulated for 750gr Bullets. 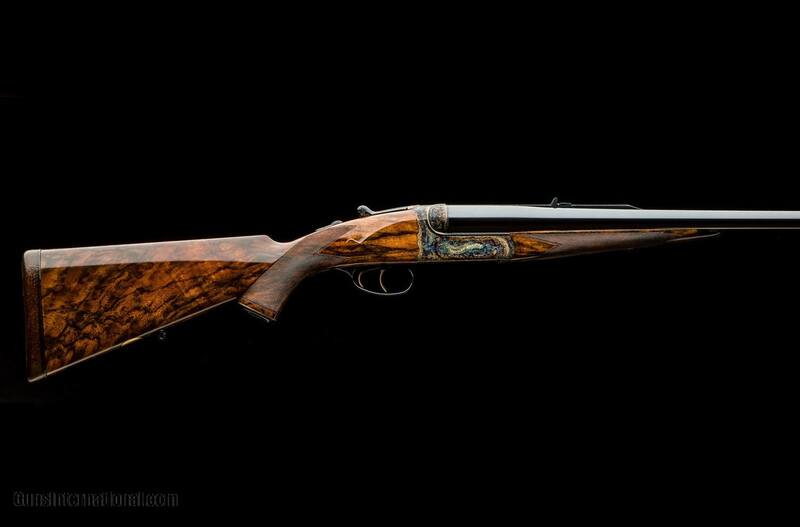 Stock is a highly figured, yet appropriately laid out, walnut stock w/ a right handed beaded cheekpiece, drop points, traditional point pattern checkering with Mullered borders, a blank gold oval and sling swivel stud. 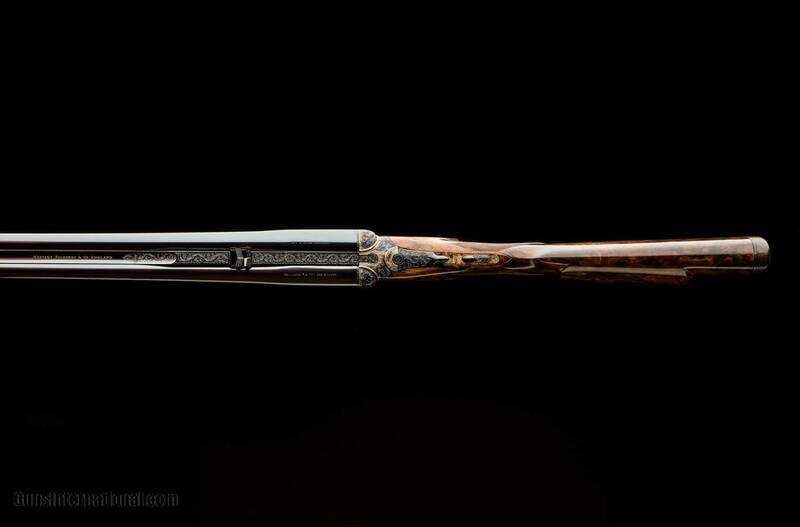 Rifle has a 15 1/8" LOP over a leather covered pad and a splinter forend with an ebony forend tip and Deeley forend latch. The rifle weighs 13 lbs. 6 oz. Rifle is complete in a Maker's Best O&L case w/ accouterments and canvas outer cover with the rifles descriptions and serial number on the initial patch. At Westley Richards we know of only one double rifle produced by our firm having a scroll back action. 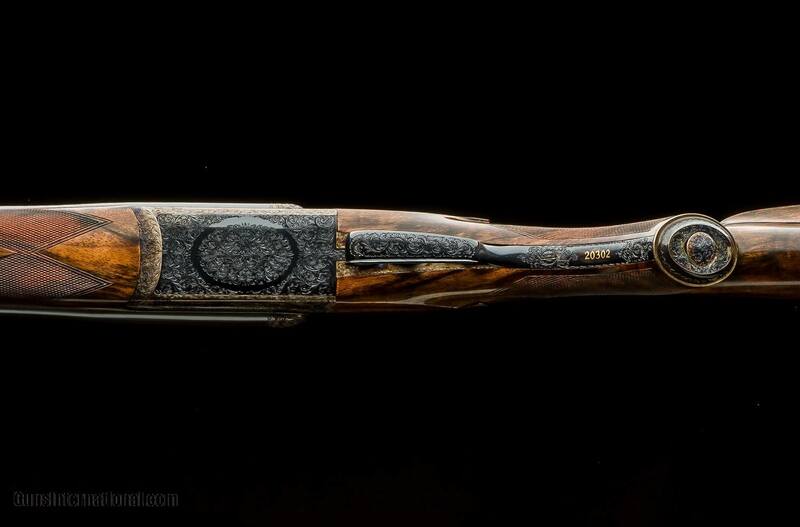 In 2013 the shape was re-introduced and this is the first rifle, since WWII, produced with this action shape. The scalloped edges of the back of the action are an instantly recognizable Westley feature and the design lends its self to a much more rounded bar making a sleeker shape that is more pleasant to carry on long tracks. 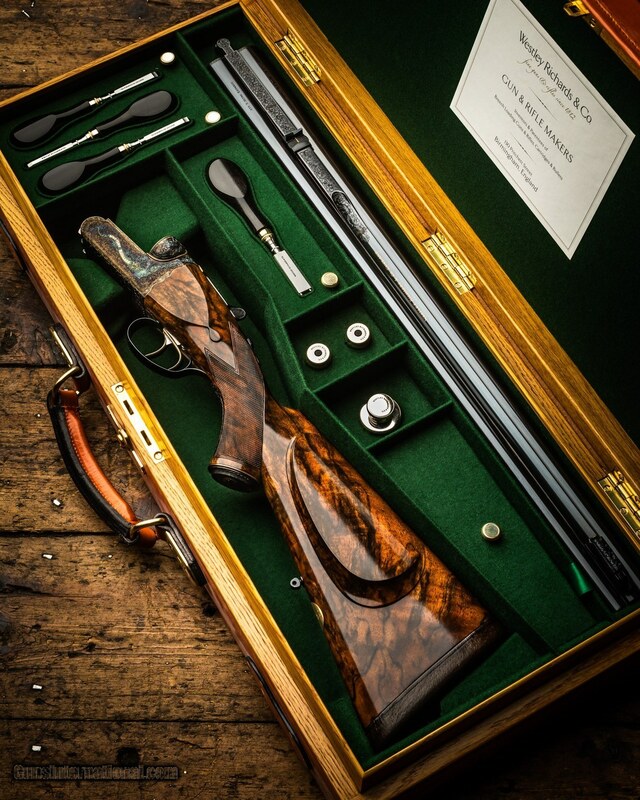 For all intents and purposes, this is a brand new rifle and it offers a very rare opportunity to acquire a modern Westley Richards double rifle and forgo the 3-4 year delivery time. 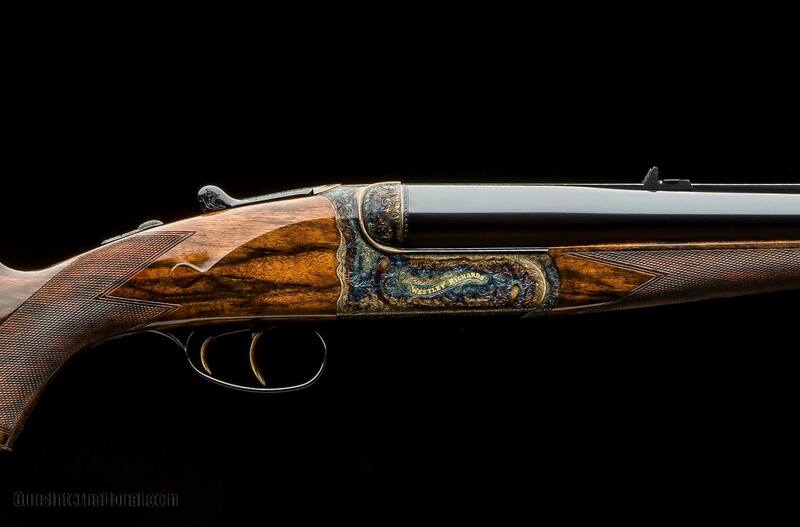 Having produced just over 100 rifles in .577 3" NE, Westley Richards has produced more double rifles in this caliber than any other English rifle maker. 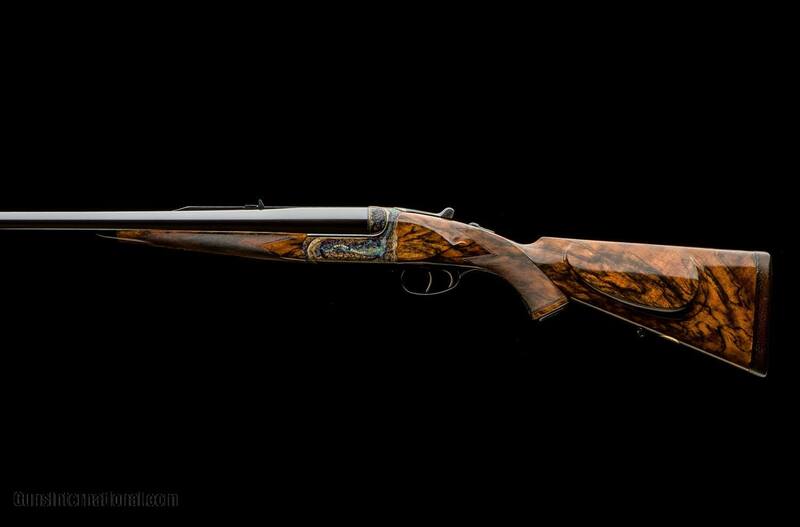 Several of these rifles belonging to famous hunters such as James Sutherland, Ernest Hemingway and Stuart Granger.